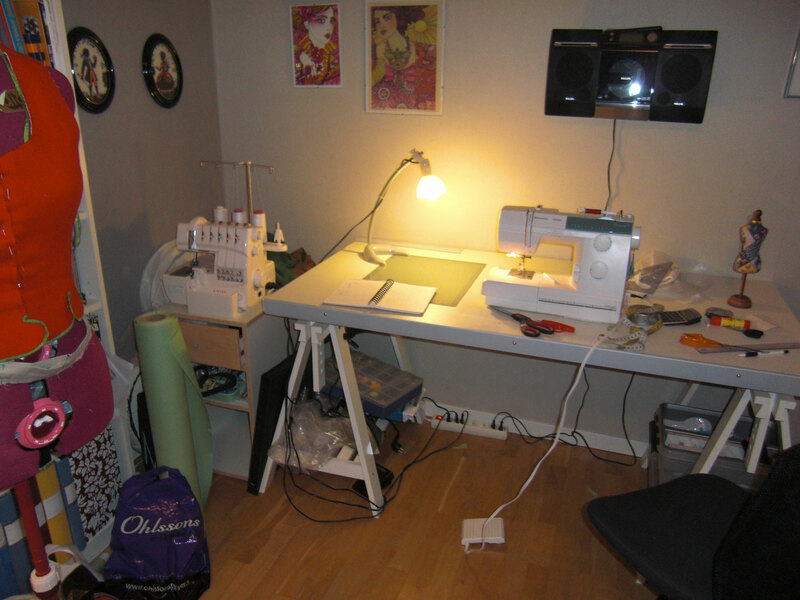 Last time I told you about my favourite room in our new apartment, and I think most of you are in total understanding about how great it feels to have a place dedicated only for sewing (and drawing). 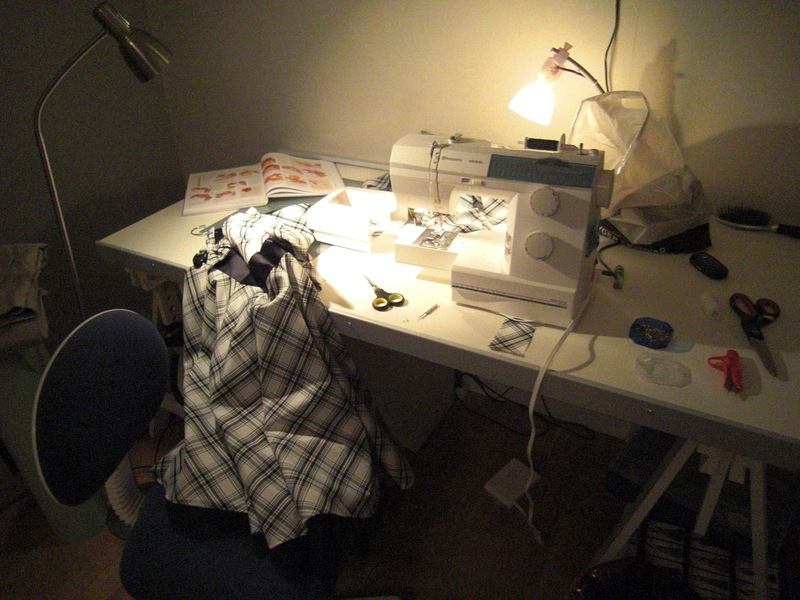 But for you how don’t know, I will show you some of my past sewing “rooms”. But first I think I will tell you about my machines and favourite tools. 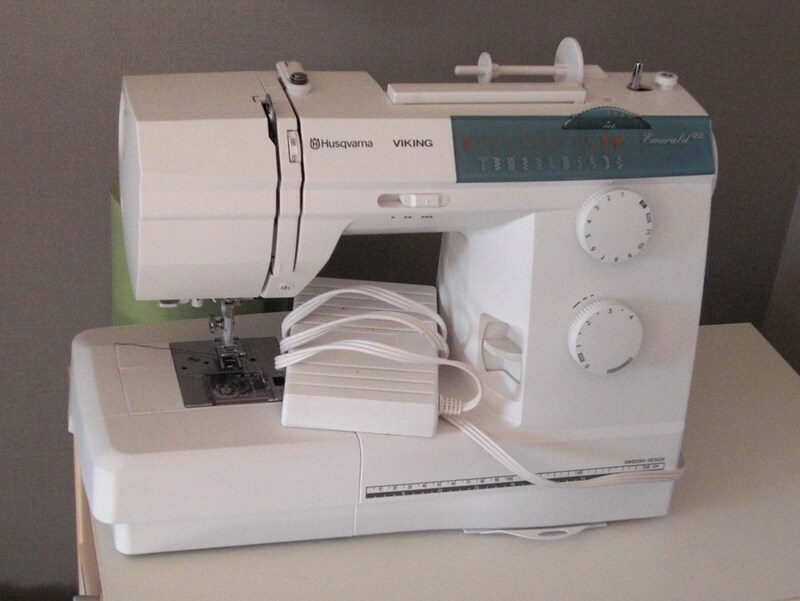 This is my sewing machine (Husqvarna Emerald 122), and she’s been faitful (and I to her) for the past 8 years. And hopefully she will stay true for a couple more years, even though the noises she makes make me think she soon will need to slow down and retire. 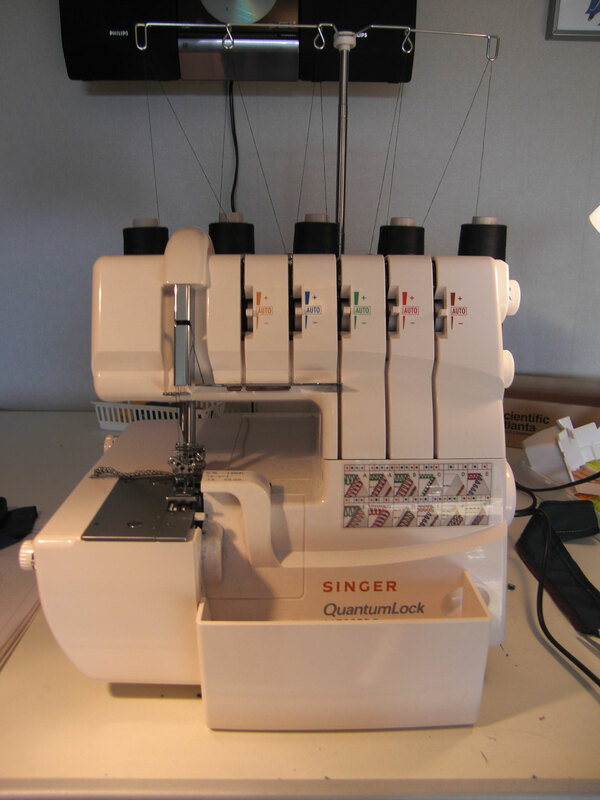 And this is my overlock/coverlock (Singer Quantum ?) 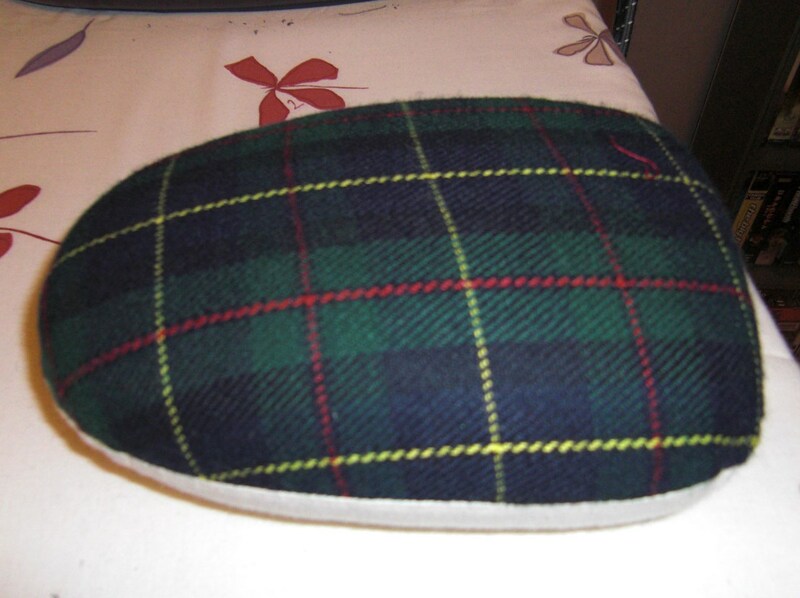 which I bough 5 years ago with my sewing ernings. I’m not as in love with her as I should be, but I guess I never really taken the time to get to know her poperly. 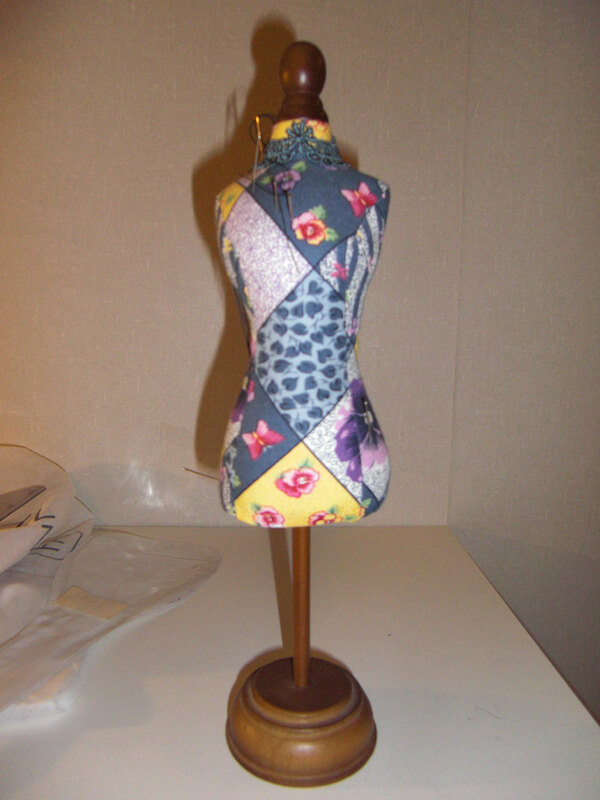 She works just fine (even though she sometimes refuses to sew over thick and bulky fabrics). 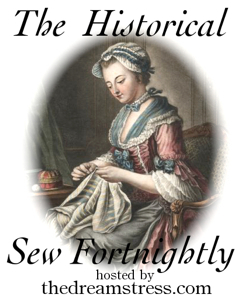 But latley I’ve been abandon her more and more thue to my historical sewing. 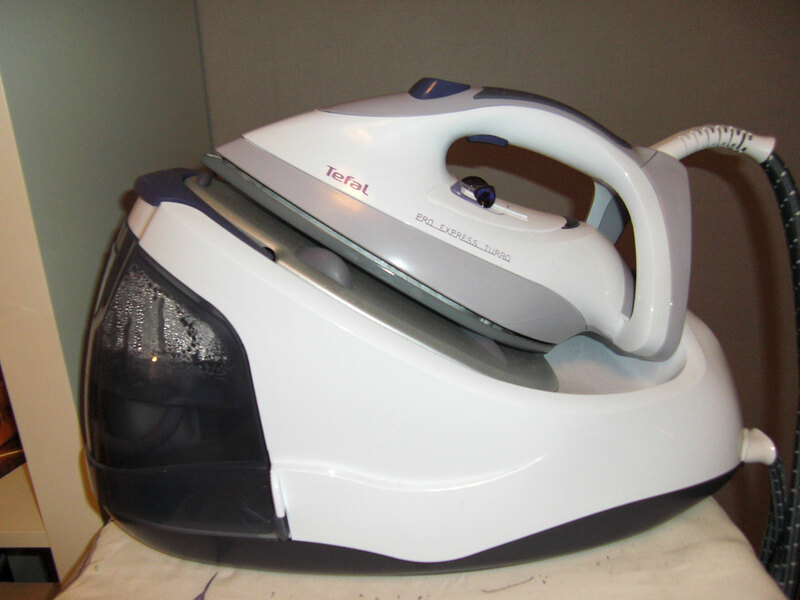 This is one of my best buy ever – A steaming iron (Tefal turbo pro). I can have her working all day, and only have to refil her once or twice (without turning her of), and she still never complain or overheat. Sadly she did die the “never stop steaming” death 6 months ago, when something broke inside and she just flooded the room with steam and coulden’t be stopped. So I replaced her with a cousin (which I hate, and dont have any picture of). I bought this pin-cusion in a dollarstore and she’s been living on my sewing table ever since. Both pretty and useful. On thing every seamstres needs is some good pressing tools. I love this “tailors ham” and uses it as often as I can. I also just got a “sleeve board” and that’s great working with pants, shirts and shorter straight seams. 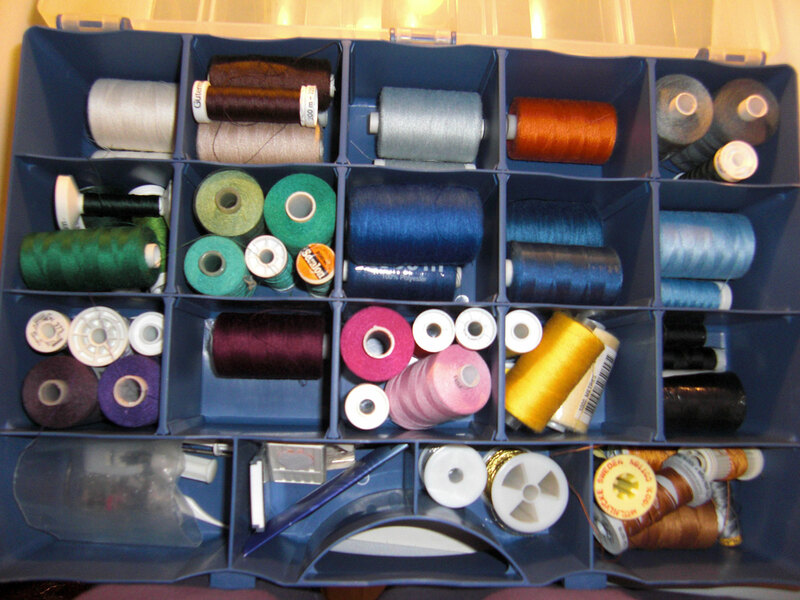 I keep my threads in a handy box sorted by collour and type (buttonhole thread, extra strong ect). This photo is old, and I think I will need one more of these boxes now. 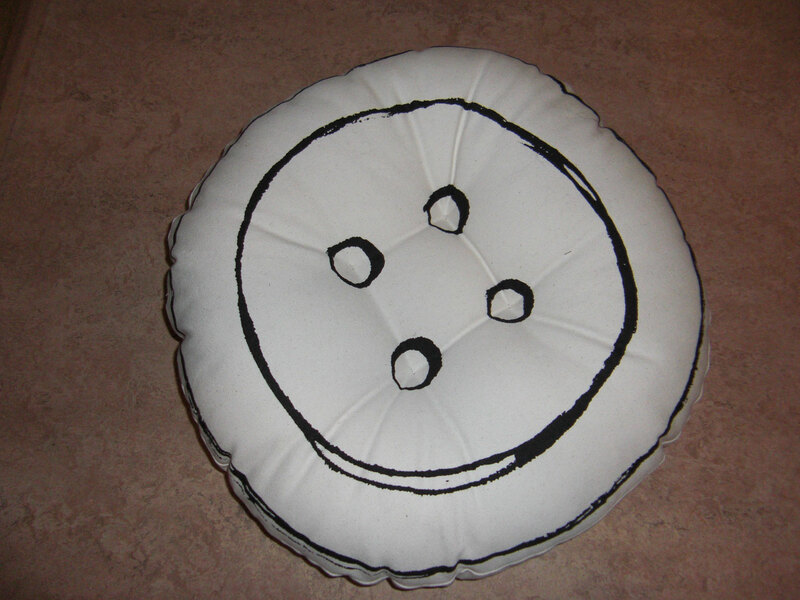 Extra points for guessing the use of this cushion. Hint: It’s a floor cusihon… …I use it when cuting fabric on the floor, saves my knees a lot of pain. I acctualy bought this a H&Ms “Home” department 5 years ago, and it’s been great. And now onto my past workspaces. 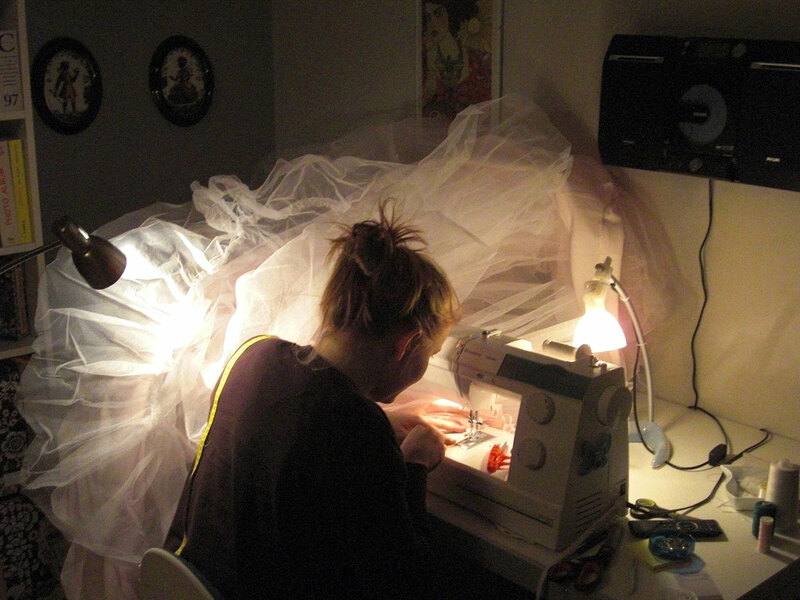 When I was young, and still lived at my parents house, I use to take the sewing machine (a borrowed one from an aunt) and set it up on the kitchen table. This proved a bit tedious since at every meal I needed to clean it away, and then reset everything once the meal was over. 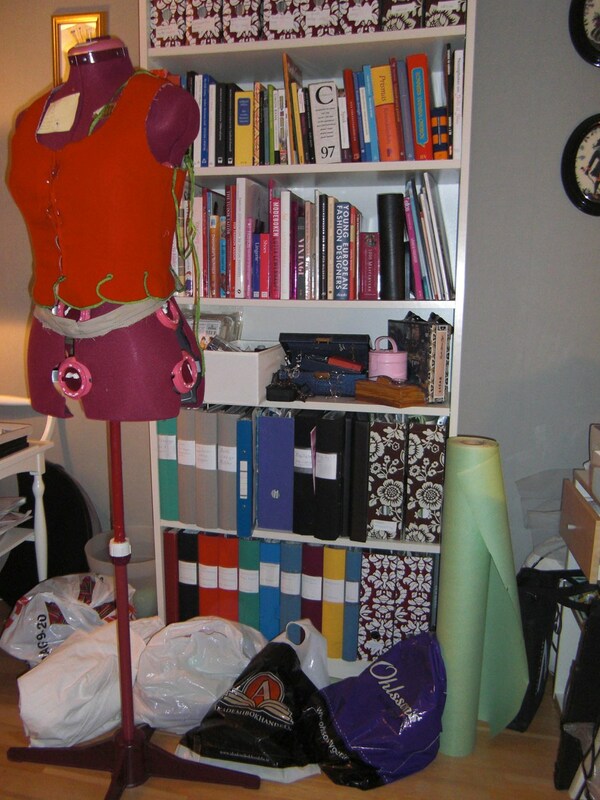 When I grew older me and my boyfriend’s first apartment was a 2-room, with a fairly big livingroom, where I used one of the corners for my sewing space. Looking at it now it look so messy. But I did had a big table to set the machine on. 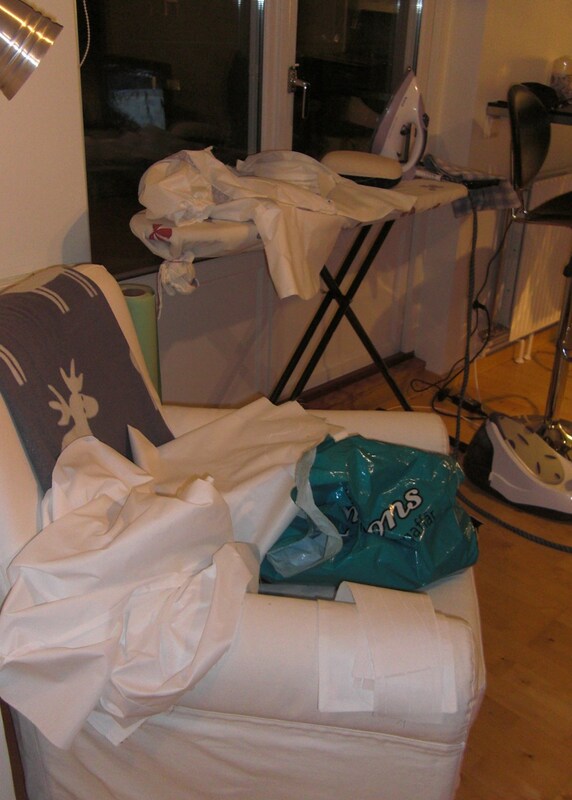 Back then I had this “great” way of storing my up-coming projects – in plastic bags on the floor next to the dressform. Omg, and my boyfriend didn’t leave me. At least I did have a bookshelf for my sewing books. 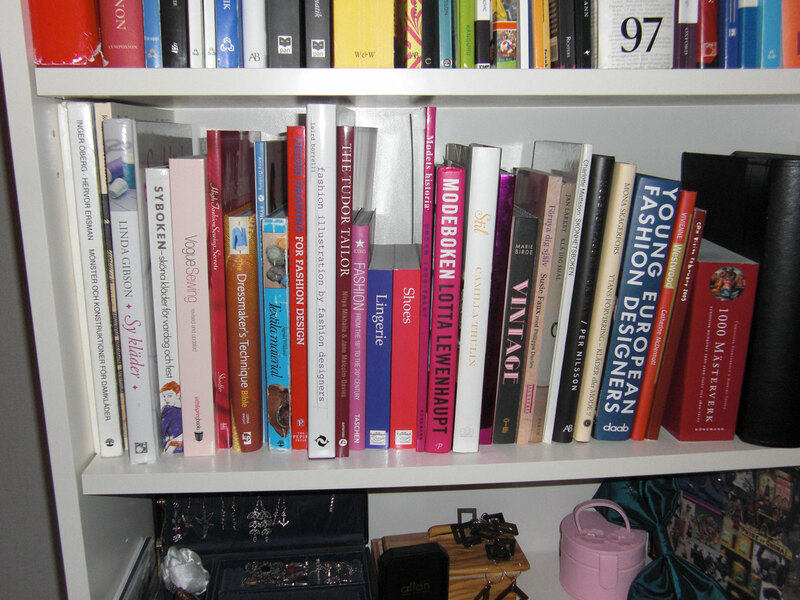 Only at this time I only had this many sewing/fashion books (half a shell). “The messy creative process”. But I do remember that chair – It was so old and uncomfortable, having spikes from the seat almost coming through the fabric. You didn’t have those massive sewing spurs that goes on for hours and hours on that chair, I tell you. 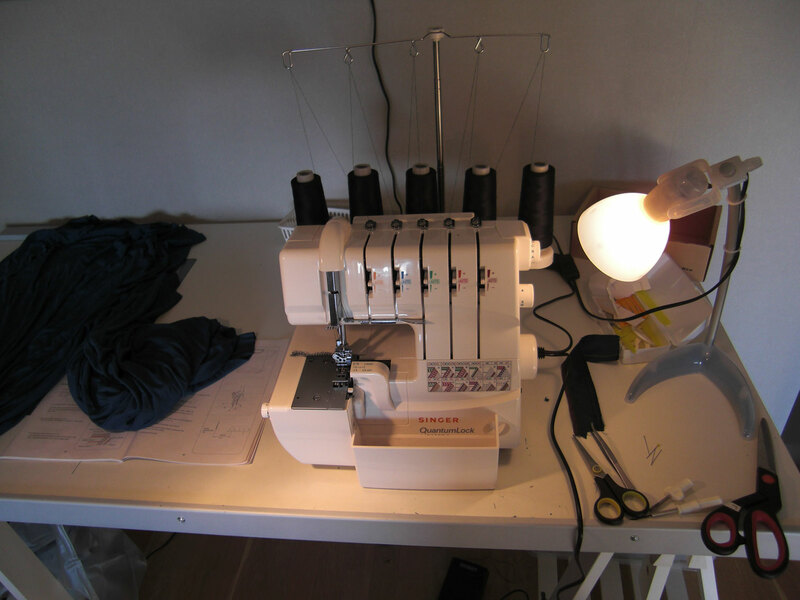 Then we moved to a smal 1-room flat, and I needed to choose wisely on which of my sewing things to take to our new home. Here I got a smal corner behind the beed and the bureau. And do notice the newspaper suffed under the leg to keep the dreadful table somewhat stable. 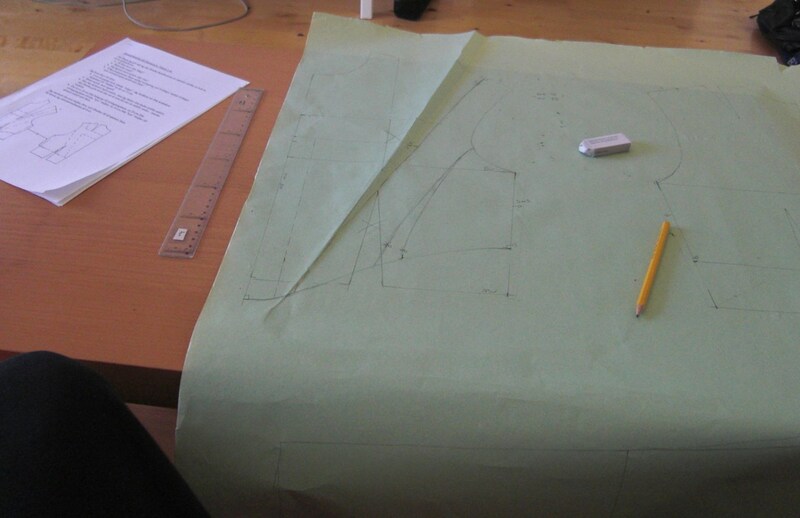 Doing my pattern drafting at our coffé table. And the ironing at the window, beside the kitchen bar-table. 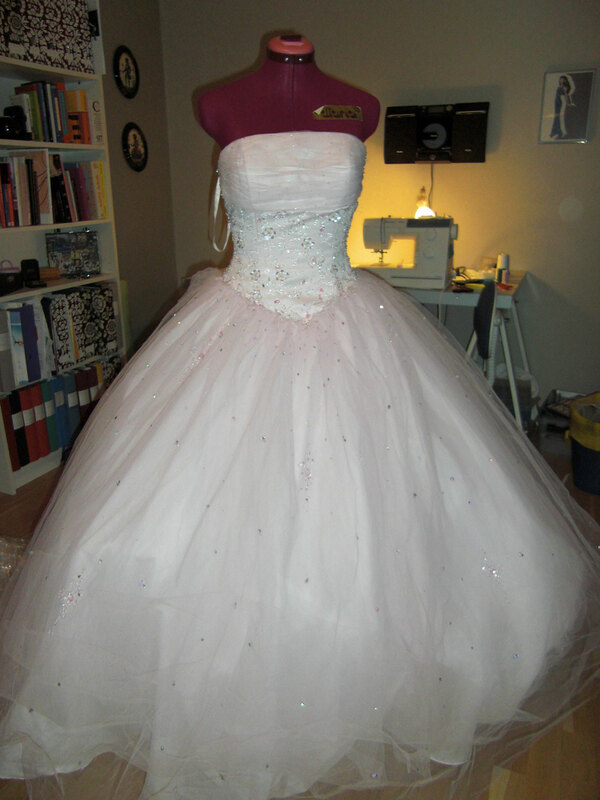 This was insane, and I missed my dressform a great deal, but it only lasted about 1,5 years. Then we moved again – and once more we setteled for a 1-room apartment. Sadly I couldn’t find any pictures of my workspace, which lasted for about 2 years. But I can tell you this 1-room apartments had suprisingly many rooms, like kitchen/sewing room and living room/beed room/saloon/dining room/sewing-in-front-of-the-Tv-room. I basacly had my stuff everywhere. 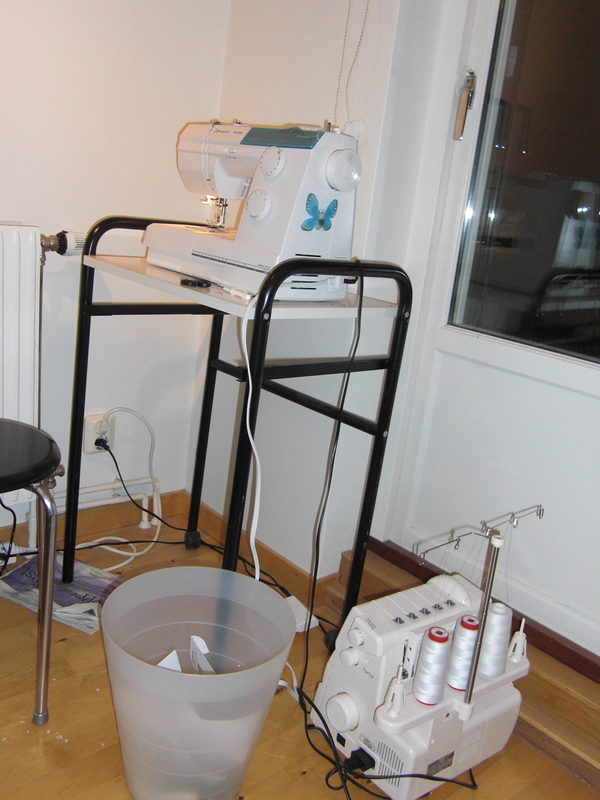 And now we are living in our 5th apartment – and I finaly got my very own sewing room. And you know – the smaler your space are, the bigger the dresses will be. Me (5 years ago) working from under a pile of tuille. My husband and I shared a one-room flat (we call them studio apartments here) for eleven years — I had been there for ten years before that on my own. We finally found a larger place that we could afford (we’re in NYC where everything is absurdly overpriced) and it has changed our lives so much for the better. Enjoy your space! Oh, thats sounds like a long time living on top of eachohter. 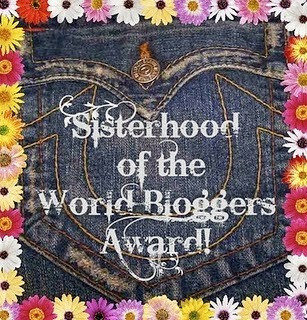 Happy to hear you found something bigger.